​Rock It Trail, in Aliso & Wood Canyons! The 5K is a fast out and back course along the Aliso Creek Trail (East) to Wood Canyon. The 17K (yes 17K, almost 11 miles) offers a few challenging climbs, including Rock it Trail, technical terrain, and nice long flat stretches. Both distances are almost entirely on trails except for one brief paved road crossing. Parking location: Laguna Niguel Regional Park located at 28241 La Paz Road in Laguna Niguel. The park opens at 7:00. We'll be set up at the end of the road that leads to picnic shelter 1. Check in for registered runners begins at 6:45 AM. 17K begins at 8:00 AM (subject to change). Participants must maintain an 18 min/mile or faster. Inclusions: Awesome custom race medal for all participants, tech shirt, race photos, post-race snacks. Top place age group winners (both races) receive awards. Strollers are not permitted on either course. No dogs are allowed anywhere in Aliso & Wood Canyons Wilderness Park. Due to course changes driven by Aliso Fire-related trail closures, the 17K is now closer to 18K (approx 11.1 miles). Updated map is here. 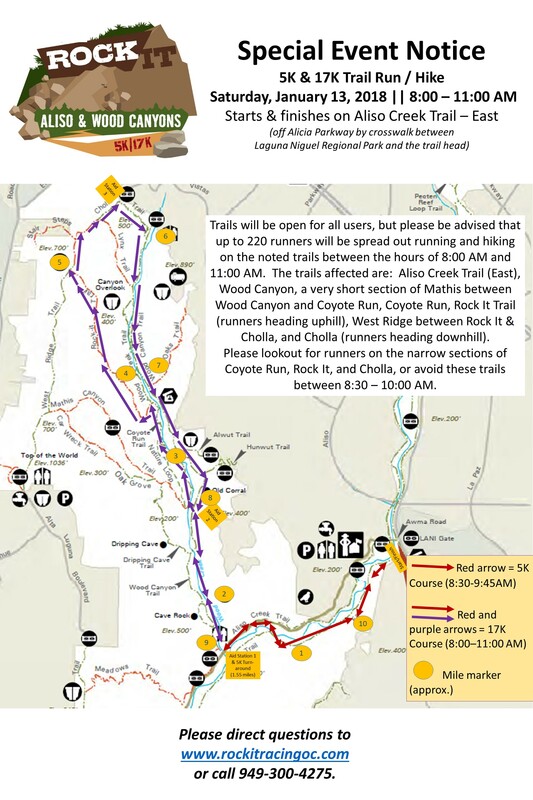 Race may be rescheduled due to rain or muddy conditions, per OC Parks, and up to the discretion of OC Parks leadership and Aliso & Wood Canyons Wilderness Park Rangers. If this happens, we will notify participants 48-72 prior to race day. Participants will automatically be transferred to the new date. See our FAQs and refund, transfer, and cancellation policy (also in the registration process).